Conceptual frameworks are important to ensure a clear underpinning research philosophy. Further, the use of conceptual frameworks can support structured research processes. To present a partnership model for a reflective narrative for researcher and participant. 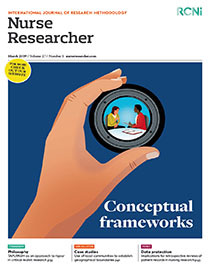 This paper positions the underpinning philosophical framework of the model in social constructionism (the idea that jointly constructed understandings form the basis for shared assumptions) and narrative enquiry. The model has five stages – study design, invitation to share a research space and partnership, a metaphorical research space, building a community story, and reading the community story to others. Core principles of the partnership model are continual reflection by the researcher, potential reflections by participants, reciprocal sharing, and partnership in research. Conclusion: A 'trajectory of self' for both participants and researchers can be enhanced within reflective partnerships. This model can be applied to studies that use narrative enquiry and are seeking a humanistic approach with participant engagement.